Published by Mountainblog on 07/01/2015 . Introducing a completely new addition to the Mammut Trail Running footwear range, the lightweight and highly cushioning MTR 201-II Max Low. Its wedge, made from a 22/28 mm thick D3O®-EVA blend, absorbs impacts and provides support while actively feeding back the generated force. The risk of twisting an ankle or similar injuries is a particular factor on long-distance runs, as fatigue starts to creep in. The MTR 201-II Max Low’s firm and robust frame structure has been designed to overcome this risk. The competition shoe also features the proven aggressive gripex™ Sonar tech sole, offering excellent grip in different kinds of terrain and making slipping almost impossible. The tread construction on the sole is inspired by the concentric pattern created by sonar waves and therefore provides support in all directions. In addition, multi-directional lugs ensure very high lateral edge stability on steep traverses and a secure grip on different surfaces. The shoe also scores highly in terms of efficiency, thanks to the improved Base Fit Advanced® technology, in which sliding webbing at the sides transfers the power from the lacing area to the sole while at the same time improving support in the shoe. 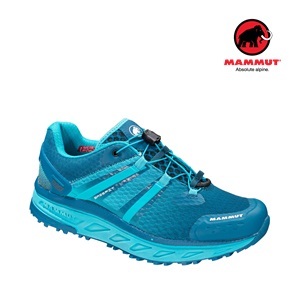 A new feature in the Mammut trail running range is the quick and easy Advanced MTR Speed lace system. The cushioning MemoFoam® concept has also been used to ensure an individual fit and provide optimal padding around the instep and ankle. The proven Rolling Concept® promotes a natural rolling movement and guarantees ergonomic support and cushioning. All combining to make the MTR 201-II Max Low the ideal long-distance expert for ultra-running events.